I’ll admit that I was fooled by the Science Fiction label on the spine. I read Snow Crash by Stephenson and really enjoyed it. But, Reamde isn’t science fiction–it’s a thriller, and only a couple of years in the future. There isn’t much happening in the book that couldn’t really happen in our own hyperfrenetic 21st century. Reamde, which Stephenson pronounced as Reem Dee, but which I pronounce as reamed–which gives the whole title new meanings–has a special attraction for me because one of the main characters is a troll. He calls himself Troll–he’s an internet troll and a hacker, and my general feeling about such people, especially if a virus they created has victimized my computer lately, is that they should all be hunted down and slain, or at least lobotomized so they can’t do it again, but the truth is that Marlon the Troll is a pretty good guy, and one hell of a computer whiz. This is a thriller about an abducted girl, named Zula, who gets involved, as hostage, with first the Russian mafia and then Islamic jihadists. She shows a lot of courage and brains, and makes some good friends along the way. A large part of the plot deals with a futuristic MMORPG set up as an even better version of World of Warcraft–that’s where the Troll comes in. It’s a super pk-er type of environment. I wouldn’t last a minute there, but it’s fun to read about the characters that thrive in such a virtual world. There’s a lot of plot, a lot of characters, a lot of action. The book is 1042 pages long, and took me a week to read. I’m not going into too much detail about it–better if you look it up for yourself. Back in the Day before the computer ruled every other waking moment, I read a lot–usually more than 100 books a year. Alas, there is only so much time, and that is no longer true. Now I finish maybe 10 books a year. I’m not keeping a book log any more, so I’m not sure how many real books I finish–more than five, less than twenty. There are also more comics than ever, especially since I can get graphic novel versions of stuff I didn’t buy. If you re-arrange the letters in Reamde, you’ll get Read Me. Good advice in this case . . . 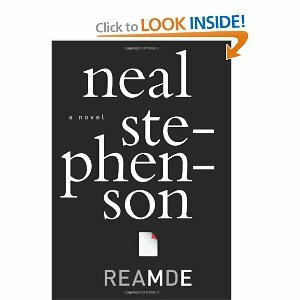 If you’ve read Reamde or anything else by Stephenson, I’d love to see your comments.